There are a few elements every outdoor kitchen needs to be a success. A grill, a fridge, and plenty of counter space that you have probably already considered when designing your space. However, when it comes to building a custom outdoor kitchen, remember that the only limit is your budget and your imagination! There are plenty of fun add-ons you can include to make your outdoor living space live up to your dreams. In today’s blog, we’ll be going over a few ideas for your kitchen that go beyond the essentials. Read on for inspiration and contact Artisan Outdoor Kitchens today to make your dream kitchen a reality! A grill may seem like the quintessential appliance for summer cooking, but that may change if you invest in a pizza oven for your custom outdoor kitchen. Pizza brings people together, with endless options for toppings, sauce, and more, and nothing can quite compare to homemade pizza. 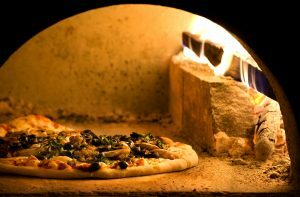 Your friends and family will always want you to host get-togethers once they taste what your own personal pizza oven can do. Smoked meat is another party-pleaser, and adding a smoker to your kitchen layout can make it easier than ever to add delicious flavor to beef, pork, chicken, and fish. Forget the small-scale smoker you’ve been propping up in the grass — explore your options. There are plenty of appliances on the market that have a grill and smoker side-by-side, so you can easily incorporate it into your existing design. Planning to make burgers on your new backyard grill? Add a deep fryer to your kitchen design and make your sides and appetizers all in one place. Create crispy, perfectly golden fries or mouth-watering fried chicken while enjoying the sunshine in your custom outdoor kitchen. Colorado is full of craft beer enthusiasts. Add a kegerator to your outdoor kitchen, and you become everyone’s favorite neighbor. You can keep your favorite beer right there on tap. You’re probably already asking yourself, “how didn’t I think of this sooner?” You can also offer kid-friendly options, with root beer or soda on tap for the under-21 crowd! If you prefer a cocktail for those relaxing summer afternoons, a built-in ice maker is a simple but worthwhile addition. Complete your outdoor bar with ready-to-go ice cubes next to your shaker and glasses. With a few extra appliances, you may even be prepared to whip up a few frozen margaritas without a single trip indoors. 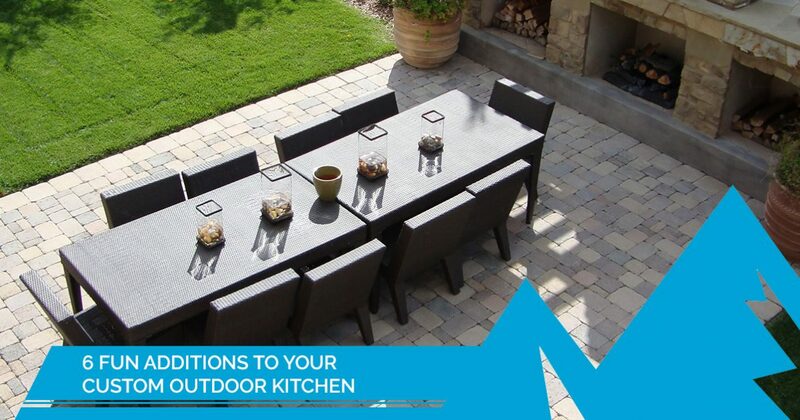 Make your outdoor kitchen the ultimate entertainment hub with a built-in stereo system. 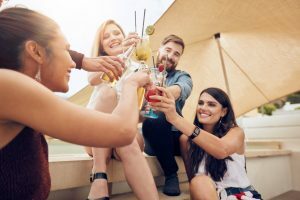 The key to any good party is good music, and you’ll have everything you need to set the mood at your fingertips with this unique addition to your outdoor living space. Play soft music in the background when it’s just the family, and then turn on the beats for parties to share your carefully crafted playlists for every event. Your custom outdoor kitchen should be more than just a grill and some stainless steel cabinets. If that were all, it would hardly be a custom kitchen. You deserve to find a few gadgets and unusual appliances that will make the space unique to you. Whether you’re a pizza lover who wants their own pizza oven in the backyard, or you want something simple and convenient like an included ice maker, you owe it to yourself to truly make your custom outdoor kitchen the space you’ve been dreaming of for years. Artisan Outdoor Kitchens is here to make it happen. Call Artisan Outdoor Kitchens today to schedule a free consultation! We take great pride in building an outdoor living space you will love for years to come, and we’ll work closely with you to ensure we not only meet your expectations, but exceed them. Start taking advantage of Colorado’s 300 days of sunshine today and visit the Artisan Outdoor Kitchen showroom in Boulder!